Hey guys, I finished my build w/ an Antec 1100 case and did not think I would need a WC system. Fast forward a month later and I desperately needed a water cooler and purchased the Corsair H100. Stupid, I know, should've looked at the specs. Problem is, the H100 uses a 240mm radiator and the Antec only has a 200mm top fan space. After a bit of research I found this graph showing that there is a space for the 240mm radiator using the two 120 mm internal intake fan slots and I installed it there. My question is, without returning the H100, does installing in the internal intake fan slots inhibit the WC system in any way? If so, how do I install the 240mm radiator externally or mod the case? Theoretical Airflow Diagram. 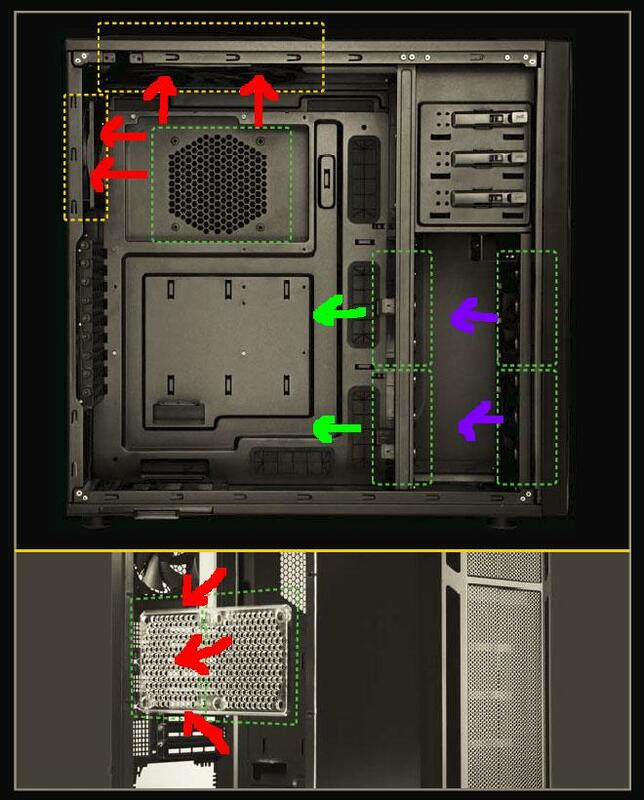 Red lines indicate fans already installed which blow air out, green is the location of the radiator and it blows air in. Purple is the location for two extra fans, not installed, which the case allows which can pull air in for the radiator. Yes? No?